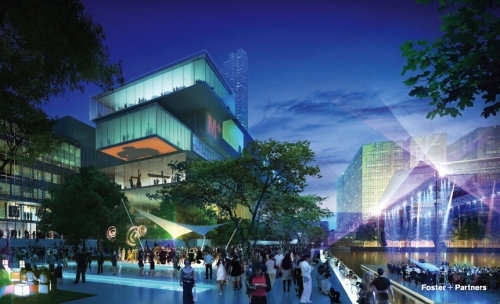 The West Kowloon Cultural District seeks to fill the void of a lacking arts scene in the Special Administrative Region. While undertakings by city governments around the world looking to create large-scale arts or culture districts sometimes come off as desperate attempts to prevent decline and irrelevance, Hong Kong has not such problem of reverting to a backwater anytime soon. Yet one has to wonder if this is not an attempt by the SAR to distinguish itself as a more refined cultural destination than its Mainland China first-tier city counterparts. If anything, the West Kowloon Cultural District PR department has done a good job so far of generating international interest with a highly publicized competition for the master plan of the project. World renowned British architecture firm Foster + Partners was recently selected as the winner. Foster + Partners beat out proposals from Rocco Design Architects Limited and OMA/Rem Koolhaas. Foster + Partners is no stranger to Hong Kong, having been behind the design of the iconic HSBC Building and the city’s masterful Chek Lap Kok Airport. The firm’s concept for the West Kowloon master plan is guided by a desire to create a ‘City Park‘ filled with greenery. Proposed buildings include an Expo Center, Opera House, Chinese Theater, Art School, Theater School, Modern Art Museum, and Concert Hall. Although the buildings for the project are yet to be designed, Foster’s master plan scheme promotes the idea of a minimally refined unifying architectural aesthetic.